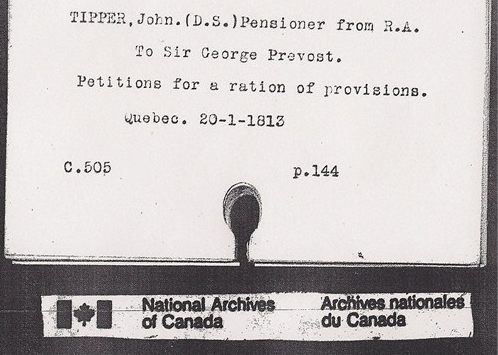 John Tipper is my first ancestor to have traveled to Canada, arrived before 1796. Until today I didn’t have many details about him. What I did know is that he was a soldier with the Royal Artillery, his wife was Gertrude and she died in Kingston, Ontario in 1805. The family lived in Montreal, Kingston and Quebec City with daughters Anne (married George Stubbs), Elizabeth (married Robert Jeffery), Mary (married John Henry Merckle) and son John (married Catherine Taylor). Today a little more was discovered about John Tipper and his family. I have index cards from LAC that a relative shared with me. I hadn’t spent any time researching the index cards any further and I was looking forward to Glenn Wright’s talk at the 2014 Ontario Genealogy Conference. From the index cards I went onto the Library and Archives website and delved further into these early military records. This has not been an easy task and I had to refer to the Help button frequently. I did manage to find this record which shows John in 1813 applying from provisions for him and his four children. having been left with four motherless children, your humble petition finds the greatest difficulty of supporting himself and family. The document does point out that John is a widow and the startling item I read is that he is blind and is supporting his family by turning a wheel for 1 pence a day. I hope that I can find out more about John and his life in the military – I would also like to learn what happened to make him lose his sight. It seems that one question can lead to 3 more! We corresponded two or three years back about your ancestor, John Tipper. I’ve just come across your subsequent posting about his blindness. Congratulations on your discovery!